If you are trying to find a place to harvest trophy whitetail deer, public land deer hunting may be the way to go for you. Some places are not hunted that much, and have some very large bucks roaming around on them. If you do your homework, you can find some great places to find a big boy, that nobody else hunts. There are many great opportunities in just about every state, to harvest a trophy buck, I found a great article on public land deer hunting that is very informative and it tells a little about the different opportunities for taking a mature trophy whitetail buck, in a lot of different states. I have hunted a few public lands in Georgia, and have harvested a very nice buck, and came close to getting a big monster whitetail buck, but he saw me before I saw him. That was on BF Grant Wildlife Management Area. It is a great place to hunt. My grandmother grew up very close to BF Grant in a little town called Godfrey, and one day I hope to harvest a big buck there close to where my grandmother grew up. I harvested a big 9-pointer that hangs in my living room on Flint River Wildlife Management Area. I did my homework, and got drawn for a quota hunt, and did the scouting, and harvested my biggest buck of my 27 years of hunting. Some of the places are hard to get drawn for, but may well be worth the wait. It took me three years to be drawn for the hunt on Flint River Wildlife Management Area. But I am so glad that I was patient, and persistent, and eventually got drawn. What a great place to hunt big bodied, big racked whitetails. I have had the chance to hunt different whitetail habitats and see a lot of different parts of the state of Georgia, thanks to public land deer hunting. Without these places, I wouldn’t have been able to hunt along the Flint River in south Georgia. Or the Piedmont region with the rolling hardwood ridges, without paying a pretty penny to do so. I am facing the possibility of transferring out of my home state with my job, and you can bet if I do, I will definitely checkout some of the different deer hunting opportunities to hunt big bucks on the states different areas open to the public. I recently saw an article in my Georgia Outdoors News, where a guy from Georgia and some of his buddies went to Kansas and he took a 300 pound eighteen pointer that scored 199 7/8. And he will be listed in the B&C and P&Y record book. Now that is something that any serious trophy hunter dreams about. And where do you think he took this trophy whitetail? Public land! Now I am not going to sit here and tell you that some times hunting these places can’t be frustrating, I have had other hunters all around me while hunting certain places. But you just have to try to get off of the beaten path, and be willing to get where other hunters are not willing to go. If you do your homework and are willing to do some hard work, you can score that trophy buck of a lifetime on land that is open to the public. 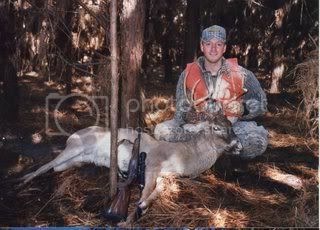 To contact Deerhuntingbigbucks.com with questions or comments fill out our DHBB contact form. Tagged public land. Bookmark the permalink. Kris, I am facing a job transfer out of my home state, and I have been wondering where I am going to hunt, and will the public land be as good as the one’s I have hunted in the past? Also will they be over crowded? I’ve always hunted public land – but out West there is a ton of it, so no reason to go private land unless you want and know a willing rancher (not an easy find!) The BLM and the US Forest Service have done a great job of managing a lot of public land out here that provides access for all types of hunters. There is land that is easy to access with good animal populations, and there is difficult land to access with good animal populations and much less hunting pressure. Not sure how it works in the rest of the country, but I’d hate to think of the day where public land no longer exists.